Climate Despair: Can Storytelling Offer a Path Toward Light? Anyone who reads climate science can see the writing on the decaying and broken sea walls, the flooded streets, the draught-stricken, hardened soils of central Africa, and their insurance premiums. There is little good news and a Federal government pushing us even faster over the precipice. Here is the truth: One cannot live in despair. It is not a home that generates light, love, or movement. Join Judith for this HSA teleconference during which we will collectively explore ways to use our art that both acknowledge and combat the darkness and bring all around us to paths of environmental action and healing. The Teleconferences lasts one hour and offer a combination of presentation, discussion and Q&A. *For international calls, please contact Elisa Pearmain for the call-in number. If you are dropped from the call or do not connect – hang up and call back! Teleconferences Are Free – although your usual long distance costs apply, there is no other charge. A collection of past Teleconferences are available here. Please review this important resource! Both members and non-members of the Healing Story Alliance are welcome to listen. We hope that these informative evenings will encourage and inspire more people to join HSA and the exciting work we are doing. We welcome donations! See donation button at the bottom of our home page. 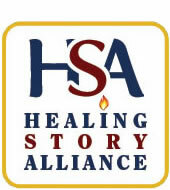 The Healing Storytelling Alliance is a special interest group of the National Storytelling Network. Our purpose is to explore and promote the use of storytelling in healing, by storytellers, health care, counseling and pastoral care professionals and all who recognize the positive power of story in health. Through the HSA, we will share our experience and our skills and collaborate to learn to be more effective in using stories to inform, inspire, nurture and heal. Membership is $25 per year for NSN members, $35 for non-NSN Members. Click here for more information on HSA. The Teleconferences lasts one hour and offer a combination of presentation, discussion, and Q&A. $35 for non-NSN Members. Click here to join HSA. If you are unable to be on the scheduled calls, go to Teleconference Recordings to listen to the recorded events, posted within a month of the original event.